After the longest period since the 1930's - we finally had at least a 5% correction. A bit overdue, but do markets still trade like they used to? These things used to be downright civil. We'll see in the next 48 hours if the old playbook of Turnaround Tuesday still works. 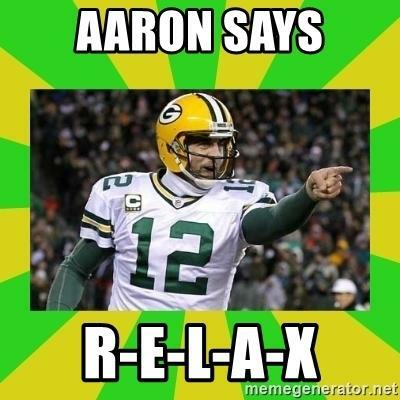 Back in 2014, after a 1-2 start, Aaron Rodgers famously said this “Five letters here for everybody out there in Packer-land: R-E-L-A-X” – they went on to make the playoffs. What’s that? Football season is over? Fine. Let’s all just take a collective breath. Breathe in – breathe out. Feel better yet? Today’s selloff on the back of last weeks weakness was a move long overdue. In the days when markets used to correct, and not just go up, this wasn’t so abnormal. The current decline in the Dow (NYSE: DIA) and the S&P 500 (NYDE: SPY) has been the biggest in 7 years. Many newer investors simply have not experienced this type of market. I look back to the mid-nineties, some of you remember – when on line trading was new and all the rage. When Stocks used to go up and down. I recall paying $40 a trade back then. Can you imagine? I know, I still shudder at that last memory. Today’s market is a little different in the sense of the speed of the moves. For the most part – the open outcry system is a relic of the past. I can only imagine how the Wolfman is holding up. But you see, there was an advantage to the outcry system. 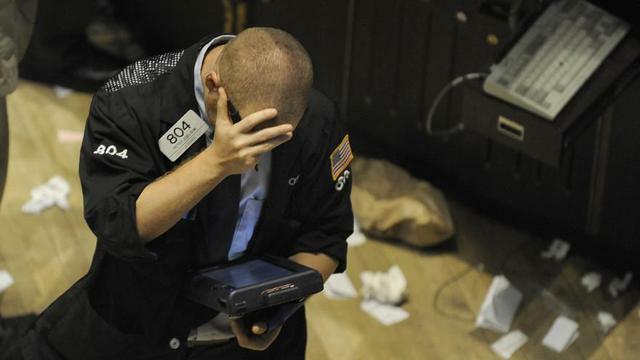 You had specialists on the floor of the NYSE, who ran the order books and provided a stabilizing flow. Orders that didn’t make sense, had a human interaction. Those days are pretty much over. With computers running the show, moves can be exacerbated. Now when markets correct – how will we replace photos of this guy? I (digitally) penned the only bearish and cautionary article I have written back on the weekend of Jan 27th, Getting Late At The Ogre Dinner Party. The article went through the editorial process and posted that Monday – right when the decline started some 2200 points ago. First off, lucky timing. I don’t want this to turn in a horn tooting exercise. No one can really predict with accuracy just when a market might unravel. As a matter of fact, as The Heinsberg pointed out very astutely in Fear No Longer Sells, But Fear of Missing Out Sure Does, the S&P had gone and incredible 398 days without a 5% correction. That simply had never happened before. Things just shouldn’t have been so easy. Second off – who cares? The point now is, where do we go from here? Well, I don’t know. This kind of thing used to be civil. But here’s how the playbook used to run. Stocks had a rough few days and would sell off into the Friday close. There would be the normal gnashing of teeth and the talking heads scurrying about and saying, “See I told you so”. Then, Sunday evening USA time, the Asian markets would come in with their first big chance to sell and would follow the New York markets lower. New York would come in Monday, in a full lather, and begin the panic selling in earnest. This cycle would repeat in Asia on Monday night, and we would come into Tuesday morning’s market with a premarket selloff. As I type this the Nikkei is off 4.7% - right on the script. Next, we need a good fear catalyst. 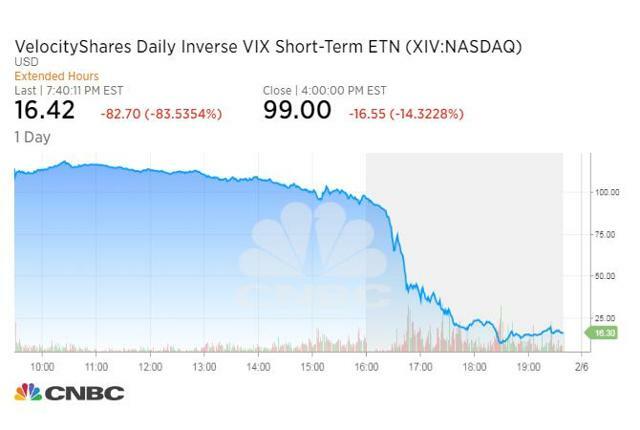 We seem to have one tonight on a rather obscure security – VelocityShares Daily Inverse VIX Short-Term exchange-traded note (Nasdaq: XIV). It’s better for the health of your portfolio that you don’t know what this is. It is a levered ETN that trades inverse to the volatility index. As stocks get crazy (up or down), it drops. It declined 14% on the day, but then in afterhours it suddenly tanked 83%. Yes, that’s not a typo. Obviously a forced liquidation - This will be all the talk by morning. So far so good. But as we haven’t had this type of selloff in some time, I’m a bit curious to see what will happen from here. We used to call them “Turn Around Tuesdays”. You get that big “whoosh” down at the open on Tuesday, then we lift stocks. If we do NOT get that “whoosh” at the open Tuesday, then that just means we’re not done going down yet. That’s just the way it used to work. If you have been a little piggy on this whole move up and haven’t sold anything, you can use the Tuesday and Wednesday lift to lighten some positions. If you’ve been selling into strength like good little boys and girls, you get to do some buying into Tuesday morning’s drop. Maybe I’ll nibble back at the Costco (NASDAQ: COST) and Facebook (NYSE: FB) that I sold back in late Jan. Maybe I’ll sell my Telsa (Nasdaq: TSLA) 385 Put into the Tuesday bottom. This is how the market used to work. It was hard. It was difficult. It was like being in a knife fight with the market trying to steal your wallet. I’m going to put on the trader hat for a week or two and take what I can get out of the market. The FOMO (Fear of Mission Out), should enable a strong rally from the lows. If you are a long-term investor and looking to pick up some solid, dividend paying stocks, Tuesday morning should be as a good a time as any. The markets have changed in the last 20 years, or then again - have they? We’ll all find out in the next 48 hours – but in the absence of any other plan, that’s how I’m going to play it. I will update any trades in my blog, you can always follow along by clicking the follow button (It’s free, but remember you get what you pay for). As always, best of luck out there. But no matter what you decide on doing, just try to relax - you’ll think and plan better when you do. Disclosure: I/we have no positions in any stocks mentioned, but may initiate a long position in DIA, SPY, FB, COST, XIV over the next 72 hours. I wrote this article myself, and it expresses my own opinions. I am not receiving compensation for it (other than from Seeking Alpha). I have no business relationship with any company whose stock is mentioned in this article.